Do Make Say Think is, in a modest way, an underground success. They are a testament to life outside mainstream music media, getting by for the most part on word of mouth, community radio air play and micro-press. Their sound is hard to describe though one might venture to call it 'non-formulaic instrumental that covers a broad spectrum of influences (the result of the members being exposed to a culture steeped in recorded material) including free and acid jazz, post rock, dub and electronic.' But it never crosses far enough to commit to one specific genre- rather it lives in an ecosystem of diversity. The band initially formed in Toronto in the mid-90's as a studio recording project for a college sound engineering course taken by one of the members. They jammed out several songs that had loose melodies tempered with free improvisation wherein the members groped towards a certain sound. What started off as casual compliance to school curriculum grew to be more serious when the band realized they had something. Lead guitarist Justin Small elaborates. Justin: "We played so many times and didn't have a format-just a few ideas that we jammed endlessly until we hit that part and that part would happen and it would seem like we were composing things where in reality we were having such a good time. So we're just playing around and then the studio happened to us and it was a new world and some people in the band have just taken to the studio in such gorgeous ways and that's where their talents truly shine." 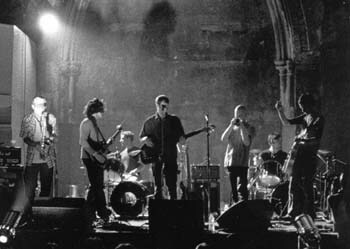 Consisting of loosely structured melodies with improvised tangents, their self-titled 1997 debut album was good but for the most part unspectacular with some glimmers of promise including a radiant gem called "If I Only..." Comprised of a simple keyboard and percussion pattern, followed by a pensive bass line and effects the song was suggestive of either melancholy or sweet longing. The tune was good enough to pluck the listener deeply on the emotional level marked that well-defined sound that foreshadowed material yet to come. This album featured five core members including Justin and Ohad Benchetrit on guitars, drummers James Payment and Jason MacKenzie (who left the band to be replaced by Dave Mitchell) and Charles Spearin on bass with contributions from other musicians. Community radio gave strong support to the Do Makes in the form of promoting shows and frequently airing their CD. Frequent gigs and a mini touring stretch brought modest numbers at first but the audience grew with each show as the band honed their direction and musical skill, thus evolving their sound. The formation of the band and subsequent emergence of their sound was no accident, however. In watching the band (who happen to be a group of men in their late twenties) perform several times and meeting them off stage, I noticed a level of interaction between the members that suggested a deep familiarity revealed through the tell tale exchange of cryptic glances and knowing gestures. Ohad: "It's basically built up on relationships. A lot of bands start with guys meeting for the first time and kind of growing together. For every member of the band, there's a history that goes back way before the band. Justin and Jimmy have been together 20 years. Meeting Charlie and Dave, this is our fourth band together for eleven years. Everybody in the band has a history with somebody else dating back to three or four other bands for ten or fifteen years so there was a real core and family thing going." James: "Given the nature of our music, communication really has to be open. It's not like we're writing pop songs with vocals and everything's got a set structure, like four bars from now I'm going to change from the chorus, but it's pretty interpretive and it's pretty open and there's no lyrics and there's no vocals so we're just relying on everybody's interplay with each other and it's important for us to listen to each other to be communicating on stage musically and personally. If the two of us aren't getting along with each other, that's definitely going to transfer into our music." Though the members have played together before in other bands, it was the first time so many formed a large group. With the commonalties they shared in previous bands, they began to explore the possibilities in their unique musical ensemble arrangement. Dave: "I think it's just different phases. It's always been a bit of a struggle. The first album is where we reached cohesion, everybody is together. That is where we identified who we were." James: "The first album we were a young band just getting together and we're trying to figure out what we're all about. For certain songs, sometimes the influences were heavily on our sleeves you can hear on our influence on what we may or may not be listening to." Aside citing influences from jazz, rock, dub and electronic artists and sharing an abiding love for Master of Puppets era Mettalica, recorded music is also the medium where they harmonize their collective musical vision. Ohad: "I love Dave's method of harmonizing. Just tell the person what you're listening to. Hand them a CD; give them a good idea of where your headspace is in. Obviously the music that you're listening to is the music that's on your mind. If the other person knows that because you're talking about it and you're sharing your musical repertoire, you're going to see where you're coming from in the jam space and you're going to be on top of it or see where you're going. When someone doesn't really understand where you're going, you can't always get there right away. The thing that you're trying and the thing that you want to do isn't what you're currently doing. I know what he's listening to so I know what he's into so I know where he's going. So I'm going to give him some slack here and let's see if he can get there before I s--- on it." The Do Make Say Think debut album sold well for an indy release, and the response was strong enough to grab the attention from some of the cinematic lords of darkness, godspeedyoublackemperor!. In fact, these members were so impressed that they decided to pass this CD on over to their own label, Constellation. Label runners Don and Ian saw enough promise in this raw release to sign the band up for their next album. It was at this point where the Do Makes made a quantum leap in their growth as a band that the rays of promise were strong enough to illuminate an entire album. Enter 2000's Good Bye Enemy Airship the Land Lord is Dead. James: "I think Good-bye Enemy Airship... was fully realized as Do Make Say Think, all of us digging with ourselves and finding something that as best as we can communicate be original. Not that anything ever is wholly original. It's all coming from inside." Recorded in a barn, the second album has a vast, epic, gloriously sprawling yet saturated sound. Because of the acoustics of the unique recording space the sounds were not isolated for recording the way a traditional studio album is. Moreover, all sorts of other sounds seeped into the album such as crickets chirping in the background, which actually happens to be a beautiful identity on the album. The guys used the lemons of accident to make the proverbial lemonade, and it worked. The new album brought the band critical acclaim and widened their audience. In addition to packing the venues in their hometown, Toronto, their touring schedule widened considerably. Charles: "After Good-bye Enemy Airship things got really good for the band in some respects. The record did really well and we toured and we started to see the world and broaden our horizons. By virtue of that, things got pretty good. We've been focusing more on what we want to do with our lives. So there has been a bit of a sense of purpose since then." In addition to playing several dates in Eastern Canada, the Do Makes went on an extensive touring schedule through Europe to push their second album. Spending concentrated time with each other, they played, ate and slept together thus the members grew stronger as a unit. Consequently, their performances became better and tighter. Justin: "There are certainly limitations that occur when playing live, but are eradicated with the discipline that comes from playing a lot. When you're on tour, you're playing for forty days straight and by the end of the tour you're on fire, you're just a super band." During the European tour, while refining their existing repertoire of songs to an audience nightly, the Do Makes also worked on new material. In between preparing for gigs and long drives between venues they sketched out some ideas in their off time, feeling out songs to add to their repertoire and even road tested these attempts in front of an audience. The places the band visited while touring and the people they encountered also had a direct influence on their music, as was the case with a song called "Reitschule." Ohad: "It's called "Reitschule" because it's a name of a co-op in Switzerland, we were on the road in Europe and we were about 2-3 weeks into the tour we got this place and was a huge place, the bottom was a restaurant, the top is this club and it's all run by young people and they let us just hang out there. We had about two days off. We played there one night and we stayed. And they treated us like we were Switzerland's long lost sons." Opening up with a simple melody comprised of two guitars in harmony with each other where not long thereafter, cymbals played at a vigorous jazz tempo cuts into the piece followed by the rest of the band playing a sweet yet energetic tune. The dreaminess and edginess form an interplay to create a wonderful melodic piece. This song was to be a part of their developing repertoire and subsequently became a part of & Yet & Yet, their latest album. This is their most focused work to date with a cleaner, less saturated sound as half was recorded in a studio and the other half on an eight track recorder. Though there still are raw moments on this album, if anything, it just adds charm to the CD. Charles: "I could say there's a bit more engineering. This one was also thrown together in a way. Really it took a long time but had the same spirit as the last record. We recorded it over three weekends. So still there's a sense of urgency and spontaneity. One of the songs was written as we recorded it. Two of the songs were written independently at home on the eight track and sort of souped up a little bit in the studio. For the most part there's still a sense of throwing it together. We did spend a little more time mixing it. I think we did pretty good sort of making the sounds we want to get." Ohad: "We do it so sporadically and there's so much time in between and it was a little disjointing. A lot of the recording wasn't done in the studio. It was done in a mock up studio we created in Justin's house and some of it was done in a legitimate studio. Some of it was done in this person's house and some of it in that person's house and all of it was done with way too much time in between." Justin: "I mean once you sort of take your songs and travel them around and sort of get the response and approval and the respect from people all over the world, it puts a lot of pressure on you to want to make them proud on top of making yourself proud. I can't speak for the rest of the guys because like I said we're all sort of a committee of decision making and each of us bring or own emotions to the table but for the most part, me--a more self conscious record." A first for the band was adding vocals by Tamara Williamson (an established singer in her own right as well as contributing to other bands like King Cobb Steelie) to the album, albeit lyricless, on the song "Soul and Onward." Justin: "My favorite song is "Soul and Onward." Just because it happened on the spot and then we called in Tamara Wilson and then were kind of nervous about it. 'We were going to put vocals on our record!' She's got just such a gorgeous voice. This is the thing about recording in the studio as opposed to playing live. If we had that idea live and it happened and we weren't sure and were a little nervous about we wouldn't--we would probably take the gamble and if it didn't work-you're playing live, there's no going back. But in the studio we were afforded the opportunity to try it out. We called Tamara over and it was beautiful and we sort of looked at each other and went, y'know...it was the same as getting a tattoo. You just go 'yup! '-it's on forever. That's the way it is ladies and gentlemen." Thus far they have completed a successful tour of eastern Canada to promote &Yet &Yet, with a European tour currently in the works and plans to foray fourth in to the United States for the fall of 2002. The band continues to grow as a unit and engage in numerous side projects to develop their individual musical growth such as Gesundheit (a mock metal band), Sphyr (instrumental/poetic spoken word project) and the Lullabye Orchestra (indie/post-rock) to name a few. Their acclaim as a band continues to grow beyond any of the members' initial expectations where once simply having an audience that exceeded a handful was enough. Do Make Say Think has overcome a great hurdle, to build a strong interdependent relationship as friends and musicians and are able to continue to grow as a unit. Despite this achievement, Justin Small maintains a more humble attitude, sentiments which seem to be echoed by the rest of the members. Justin: "I just hope we're good. Like any kind of music, we have a definite idea and those who share the idea we want to make proud."